It would be very easy for me to berate Risen 2 for the things it doesn’t get right. To drag it through the dirt because it can’t match the quality or production values of the top tier RPG’s currently dominating the genre. Easy, but totally unfair. Built by a small development team on a modest budget, Piranha Bytes have at lease succeeded in one area that many fail to prioritise, they’ve created a game with an undeniable charm. It’s something that works well in it’s favour, offering a much needed distraction from the numerous small cracks and irritable flaws that hide beneath, ready to justify a critical mauling. In the world of Risen 2, the Titans – ancient and powerful gods – have run amok. Under the command of a malevolent goddess called Mara, they’ve been left to lay waste to the world and bring humanity to the brink of extinction. You then, are inevitably thrust head first into this mess, charged with hunting down a weapon capable of vanquishing the Titans and bringing their destructive reign to an end. A typical workmanlike fantasy yarn. Where this particular tale deviates is in how you are tasked with achieving that end goal. The only man who knows how to gain the weapon needed to save the world happens to be the pirate captain Steelbeard, and the only way he’ll let you get your hands on it is if you pose as a pirate lackey and become a part of his crew. Rather than be cast as some godly knight like saviour, heroically felling foes to protect the innocent, in Risen 2 you’re quickly encouraged to become something of a no-good dirty scallywag, putting the potential for quick and easy profit gain over helping simpleton townsfolk with their insufferable errands. Much of the talents and abilities you can learn revolve around ways to become a more efficient thief, eventually able to pick locks, pick peoples pockets and even train monkeys to help steal items from unguarded houses. Everywhere you look, every town you’ll visit usually has the occasional locked chest or too-lucrative-to-pass-up building who’s locked doors always seem to hint at hiding a bevy of loot ripe for the taking. Playing up to it’s setting, there’s also plenty of hidden treasures to discover and ancient ruins to plunder. Along with treasure maps that guide you to hidden stashes of valuable loot and pirate crews to keep happy by feeding them grog, this is certainly one of the few games that uses it’s piracy setting well, always seeking ways in which to live up to that PG-13 rated image of what people like to pretend the pirates of the 18th century where like. The unfortunate downside is that most of the abilities you need in order to become a master pirate are difficult to unlock, requiring huge amount of glory points (this game’s version of experience,) and huge stacks of gold. The beginning has you with little more than the bare essentials and the general direction of where you should be going, so initially what gold and glory you can muster tends to be spent on important things like combat skills and survivability against the many harsh enemies you’ll face. It takes a while before you’re in a position to actually live up to the pirate image the game seems to be trying hard to force on you. Progression is at least simple enough. This is no Skyrim. Here the world remains linear, favouring smaller islands and coastal regions rather than one huge landmass, though each are large enough to allow limited exploration. Keeping tack of who exactly can teach new abilities can be a pain though, with the logbook making no mention of who teaches what, leading to numerous instances of backtracking. It’s not an ideal system, but the size of the environments and use of fast travel can lessen the burden of constantly travelling back and forth. To Piranha Bytes credit, it at least remains a vibrant and inviting world to explore. It’s brightly lit Caribbean inspired locales, rife with sandy beaches, towering palm trees and dense jungles hiding all manner of exotic dangers are never dull to look at or move through. And it’s certainly not a bad looking game either, bristling with some nice water effects and a strangely hypnotic day-to-night system that can alter the look and feel of the terrain as the sun goes down, lights beaming through the trees until darkness creeps in. Character models fare slightly worse, with facial animations never quite emotive enough and character movement often punctuated by wild and uncontrollable flailing limbs. It’s a small price to pay though. Questing in these locales can vary too. There’s a refreshing lack of the usual pointless meandering back and forth collecting random items for idle townsfolk (though some of those do still exist), instead, a much broader range of quests give you a more diverse selection of objectives to meet, and again, playing up to it’s pirate image, not all of them involve noble undertakings. The crux of the missions you’ll be doing however revolve around the story, it’s an aspect of the game that remains it’s most important, and even optional secondary quests all tie in to it in some way. If it falters anywhere it’s with it’s indecision with what sort of tone it wants to set. The bright, colourful graphics and eccentric characters look torn straight from the Disney pages of pirate behaviour. A family friendly picture where the most amoral act to commit in the world is theft of possessions rather than senseless slaughter. Yet the dialogue is rife with foul language, often just dolloped into conversations for the sake of it. It seems an attempt to hitch a ride on the Witcher 2 and Game of Thrones bandwagon, a misfired effort to appear more adult when the game itself looks like it is, visually at least, aimed at the whole family. It’s an uncomfortable and disjointing partnership that does more to derail the experience than it does to add to it. 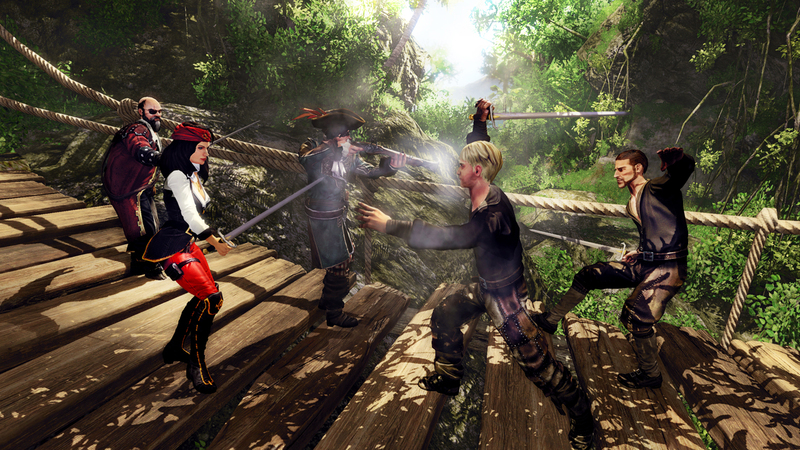 Further problems extend to the games combat system. It’s an awkward and unruly beast. Initially shipped without any sort of dodge option (which has since been patched in) it veers from mild frustration to frantic repetition. Though there’s quite a wide range of attack options open to you, factoring in sword play, musket and shotgun weapons and even under handed tricks such as throwing sand in an opponents eyes to get a few below the belt attacks in, for the most part it just isn’t that much fun. It’s hard to pin down exactly where it falls down. A mixture perhaps of the erratic animations of enemies making it difficult to judge and defend against incoming attacks, to the absolute baffling decision to not feature any sort of lock on system, making fighting more than one enemy a nightmare as your character continually swoops and slashes at the closest target. At it’s best it works on a basic level, with the constant hammering down of the attack button getting you through most encounters. At it’s worst, it’s a system you often find yourself either trying to avoid where possible, or simply luring enemies towards other non playable characters for them to fight instead. There are other flaws abound. A quest book that appears to only track the objectives of a select few quests means that, for the most part, you’ll be scouring each environment looking for mission critical items with little to go on but a brief and not very informative quest description. The sheer amount of money you need to spend to buy abilities also slows the pace of the game to almost intolerable levels during those opening few hours, and the excessive backtracking can diminish the sense of enjoyment out of exploration. By all counts this isn’t a very good game, a middle of the road average one at best anchored down by some glaring faults. Yet in spite of it all, the underlying charm of it is almost enough to make you forgive what it gets wrong. Few games welcome you into their world with such enthusiasm, fewer still can ever get the balance of good storytelling propped up by an interesting setting and theme to work. Risen 2 does, and by exploiting it’s Pirate theme to it’s fullest potential it presents and RPG far more interesting to explore than those that insist on recycling the same tired Tolkein inspired fantasy clichés that have bogged down the genre for far too long. It’s still easy to bash though. It’s competition still does many things better than it, with higher production values and an a difficulty curve that doesn’t randomly spike every so often. But Risen 2 isn’t the kind of game that deserves to be put down because of what it couldn’t achieve, it should be celebrated for what it does. Sure, not everyone will take to this high seas adventure, but for those who stick it out, that heartfelt charm and it’s welcoming visuals certainly won’t make it’s journey feel like a wasted one.